What are the numbers in Red & Blue on 1911 Census? Over recent weeks I have had a number of people ask me what the numbers written in blue and red ink mean on the 1911 census. The beginning of 20th C was a time of massive change in industry and a giant steps forward in technological development in Britain. The government needed to understand which industries were in growth or decline, so in the 1911 census for the first time people were asked to indicate which industry they worked in, together with their profession or trade. A large number of people misunderstood this question and provided more information than they were required to, giving the name of their employer, as well as the industry. This has given genealogists a fuller picture the life of their ancestors, and has enabled them to follow a path through the employer details for further research. If you find it difficult to interpret an ancestors occupation then the codes may help. 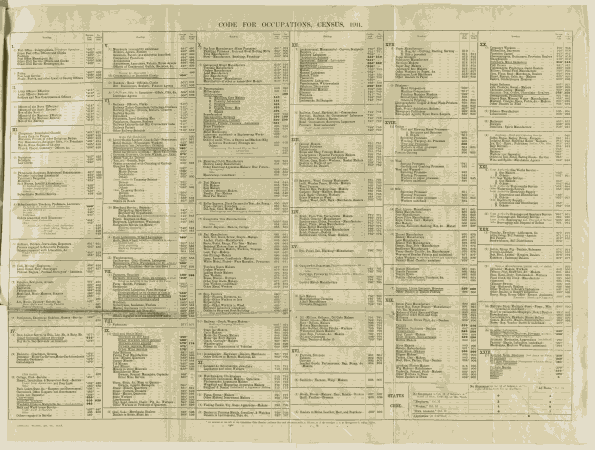 A list of the Occupation codes can also be found on the Findmypast 1911 Census website. A similar list of codes were generated to categorise the birthplace of individuals, again useful if unable to interpret what was written on the form. A list of the Birthplace codes can also be found on the Findmypast 1911 Census website.